The opponents of the gay debate said they acted after "detecting well-orchestrated machination" by delegates from Canada and Belgium who had reportedly lobbied members to vote in favour of the motion. The LGBT agenda had been presented to the Assembly for debate as an "emergency item" on the agenda of the upcoming 140th IPU Assembly. The question was on whether the standing Committee on Democracy and Human Rights could hold a panel debate that would lead to a resolution titled: "The role of Parliaments in ending discrimination based on sexual orientation and gender identity and ensuring respect for the human rights of LGBT persons". Uganda's delegation comprised Ms Mourine Osoru (Arua District), Mr Abdulatif Sebaggala (Kawempe North), Ms Rose Kabagyeni (Kisoro District), Ms Esther Anyakun (Nakapiripirit District), Mr Paul Akamba (Busiki) and Mr Francis Mwijukye (Buhweju). "Article 1(2) of the IPU Statute states that the Inter-Parliamentary Union shall work for peace and cooperation among peoples and for the solid establishment of representative institution and also contribute to the defence and promotion of human rights, which are universal in scope. The agenda presented here has been widely rejected by many member states hence lacking universality in scope," Mr Akamba said. 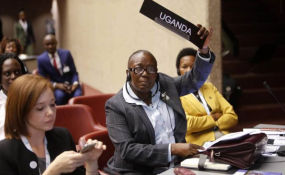 After the vote, Ms Kadaga said they would continue fighting what she termed as "uncivilised and unchristian behaviours." "I am so happy that this battle has finally been won. It started in St. Petersburg in Russia when they attempted to smuggle it in. Today, we have made a final vote that will prohibit the issue of LGBT from appearing on the IPU agenda," she said.